Remote Desktop Protocol, or RDP, is a fast and convenient way for users to connect to their home or work computers from a remote location. This technology is proprietary to Microsoft, but versions exist for basically any alternative operating system, such as Mac OSX or Linux. Having an RDP program on your computer is only half the battle, and in todays world the expectation that you can be at your computer at moments notice is growing everyday. Access to your home or work computer from a mobile device is highly desirable by mobile professionals, so finding a quality RDP client for you Android device can be extremely important. 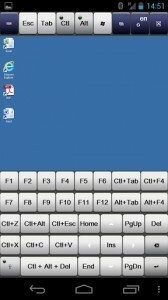 AccessToGo Remote, by developer Ericom Desktop, is a fantastic choice for RDP access on the go from your Android device. Ericom claims that AccessToGo is the “FASTEST, remote desktop RDP client on the market.” This would be difficult to determine without extensive side-by-side comparisons among various models of desktop and clients, but suffice to say that AccessToGo is obviously fast and very responsive. Remember to already have an RDP application running on your host computer, and that the ‘Home’ version of many OS do not include RDP support out of the box. There are some strict requirements when it comes to the hardware and software needed to make use of this Android app. You will need a device running on at least 512MB of RAM, not a hard thing to do these days, and you will need to be running at least Android 2.1 or better. Some features, such as the Bluetooth support require a higher version of the OS. Our experience with this app was phenomenal, with very little lag and no lost connections during testing. Some users have complained of sluggishness or crashing, but on an HTC One X there were few flaws noticed. Access to a remote Windows XP computer began in less than 30 seconds. Tapping the screen results in a small bubble forming to show you the exact spot where you touched and its corresponding location on the host computers desktop. Taps were recognized quickly and accurately. Holding down the tap will result in a right-click, which is a super-simple way to overcome that small barrier to touch devices. Typing is a bit difficult, but there’s little that could be done about that from a mobile user perspective. You can type as fast as you can text, but expect the same results as far as results are concerned. There are more advanced features that can be purchased with the Ericom Blaze RDP Acceleration package, including reducing total bandwidth consumption by 90-percent, but these additional features were not tested as a part of this review. Features such as increased speed, better security, and html5 support may make this option a good choice for some users, but it’s not required to use the app. Overall this is a fantastic product that performs as advertised. 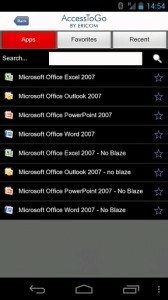 If you’re a mobile professional, or just a user looking for access on the run, AccessToGo is a great solution. It’s free to use and the results are incredible. AccessToGo is available now in the Google Play Store. It is available for Android devices running 2.1 and up. The version reviewed was 1.6.0 and the download is 10MB.A small expedite fee was paid by the developer to speed up the publication of this Androidapp review.